Old. Dunkelfuchs, geb. 1993, 171 cm. Don Schufro consistently produces top results. Danish mare of the year 2007 ”Uno Donna Unique” and Oldenburg mare of the year 2007 ”Rebelle” are some of the latest highlights. Rebelle won the performance test in Vechta out of 241 mares and also became 3 year old riding champion. 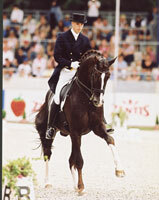 At the elite show in Denmark Don Schufro was grand sire to two of the gold medal mares. Don Schufro is for the 7th consecutive time topping the German breeding ranking with a dressage index of 181 which proves him to be a worthy successor to his sire Donnerhall as the world’s leading progenitor of dressage horses. His offspring excels with very high ridability and extremely good gaits of which the canter is often world class. His son Diamond Hit has won Grand Prix with Emma Hindle. Many of Don Schufro’s progeny like Dexter/Holga Finken, Donna Asana/Lone Jørgensen, Donatella/Betina Laisbo and Græsmarkens Don Pedro/Anemette Holm Petersen are successful at “small tour” level. 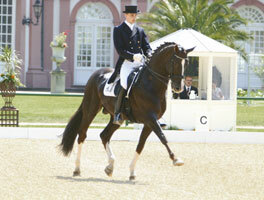 Don Schufro himself won the dressage division of the performance test with a massive score of 154.93 points. He has numerous victories and placings in Grand Prix at prestigious shows like Aachen, Bremen, Wiesbaden, Lingen, Neumünster and Nörthen Hardenberg. Don Schufro is bred identically to Don Primero as their dams are full sisters. A full sister of Don Schufro is the dam to the approved stallions Cappuccino and Sunny Boy. Another full sister, Farina, is dam of the Austrian rising dressage star Pentagon’s Peron. Yet another full sister, Fabina, was Oldenburg mare of the year at the elite show in Rastede in 2003 and prior to this she won the performance test with 214 participating mares. Her first son is the licensed stallion Red Rebel. This proves that Don Schufro and his relatives are a warranty for quality. He has sired 13 approved sons like Don Romantic, Don Caruso, Diamond Hit, Don Laurie I + II . 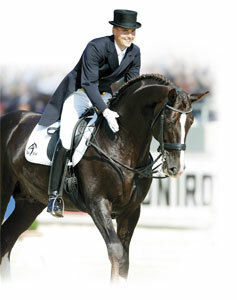 In Danish Warmblood more than 20 of his daughters have been awarded a medal at the elite show; 4 of them gold medals. Don Schufro is approved in Denmark, Oldenburg, Hanover, KWPN, Rhineland and Westphalia.